We can work with your own designs or create custom designs for you and incorporate them into clothing, pillows, throws, bed linens, or any fabric you want to use to make a unique statement. 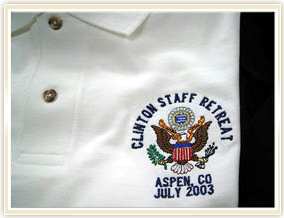 Monogrammed shirts for President Clinton's staff retreat. 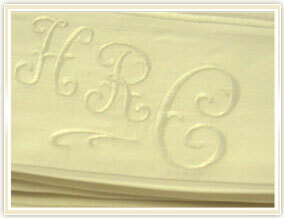 Monogrammed sheets for Senator Hillary Rodham Clinton. 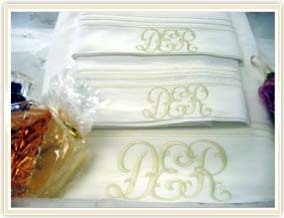 Monogrammed hankerchief from a daughter to her mother on her wedding day. 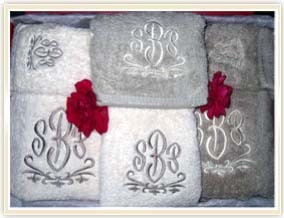 Monogrammed towels that were given as a wedding gift. 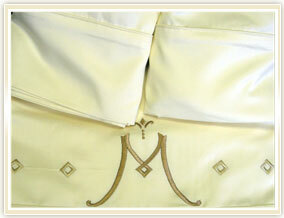 Custom monogrammed sheets for a designer. 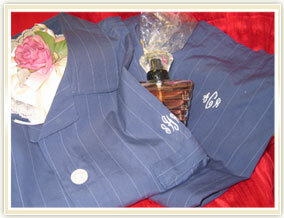 Monogrammed pajamas for a couple. The top is for her and the bottom is for him. 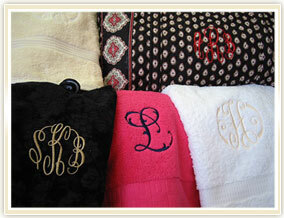 Beautifully embroidered monograms for sheets and bags. 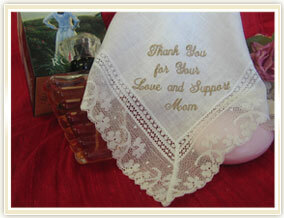 Copyright � 2009-2013 European Design, Inc. �All rights reserved.